Points / points group, 2 points / multiple points to get line, 3 points / multiple points to get circle or arc, distance between 2 points, average distance between 2 lines, distance between point and line, distance between 2 circle centers, distance between circle and line, angle and cross point of 2 lines. 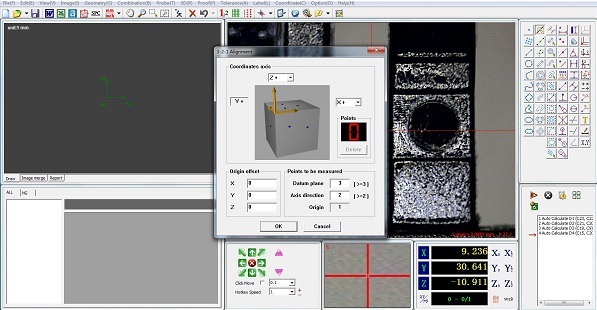 Offset, rotate, combining, parallel, vertical, mirror, crossing, tangent, users can use the function to create elements for assisting the complicated parts measuring. Direct label on the drawing area or the image area, the 2 areas are able to display the measuring result labels at the same time. The measuring parts are not required for aligning, the coordinates system offset, rotating, alignment function are available. Based on users’ using habit, adjusting the window layout, setting the common use tools. Multiple automatic edge detecting tools included, increase the measuring efficiency. Automatic recognize the circle, line and arc of the image. Adjusting the CCD parameters setting, increase the adaptive capability, eliminating fuzzy function, to acquire the correct measuring data. 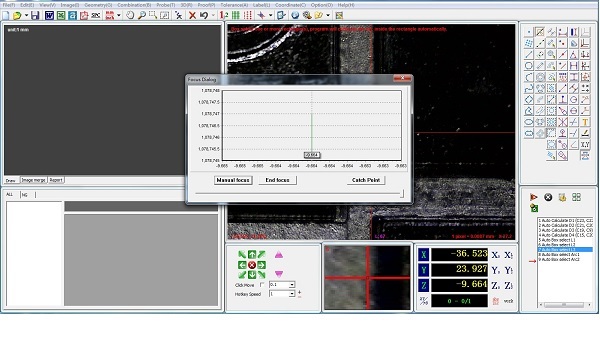 Detecting 4 sides in one time, achieve fast measuring. 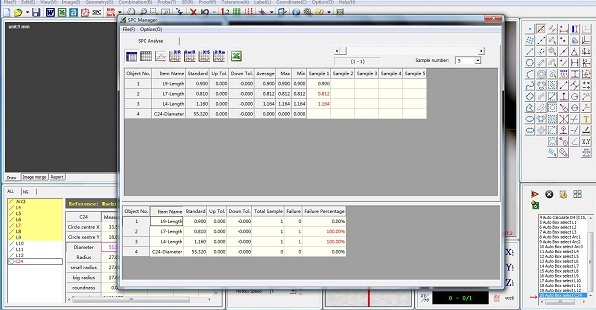 Users can set the Excel report format based on requirement. Easy for users to achieve quality control data. 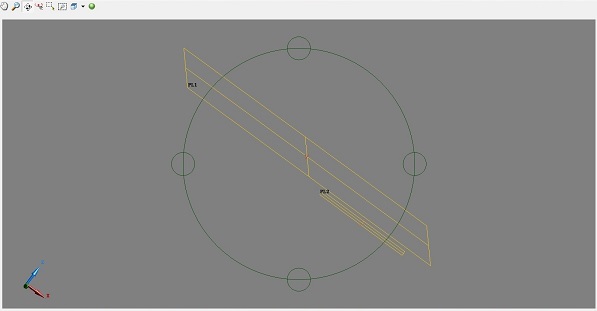 Auto focusing, automatic measuring, matrix measuring, the program is able to input DXF files, to achieve comparison with the part image or the measured graphic. 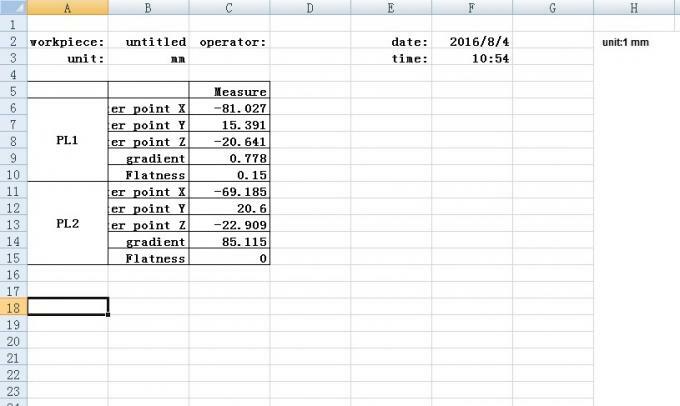 Also it is possible to take 2 points in the image area to get the measuring error value. With the optional touch probe accessories users can achieve 3D compound measuring. 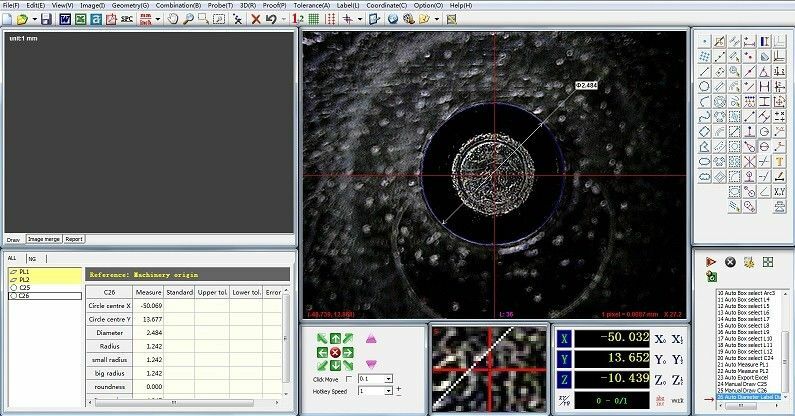 Perfect combination of the image and touch probe measuring, automatically switching by the measuring program, provides fast measuring for the complicated parts.